Start the BBQ and get ‘er hot. 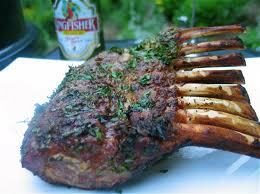 Make the honey mustard thyme sauce and spread over the lamb. Sear lamb on the hot side of the fire until grill marked nicely. Move to the 200 to 225 degree side of the grill. If you have the type of BBQ that has a smoker side, move it over there. Cook ’til medium rare. (about 10 degrees before ready because it will continue to cook.) Remove from grill and wrap in foil to keep warm. Let rest for 15-20 minutes. Cut into separate chops and serve immediately upon slicing! This entry was posted in Fire and Smoke, Lamb. Bookmark the permalink.